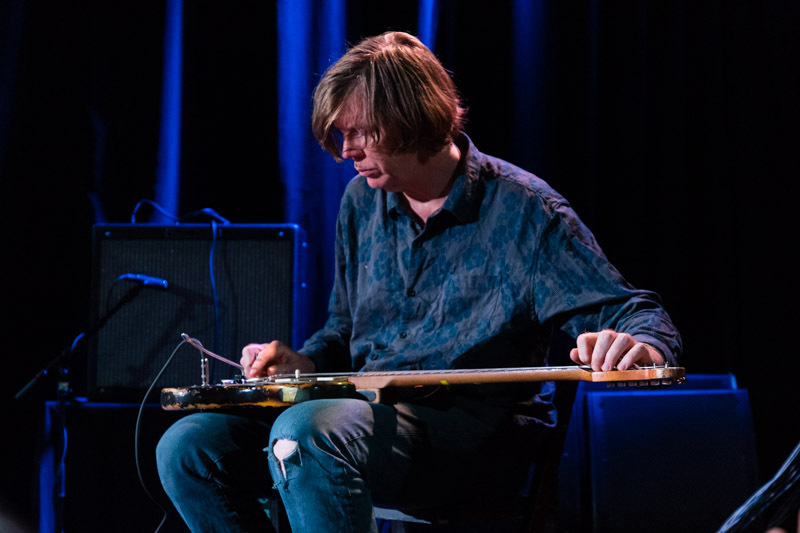 Thurston Moore performs at The Chapel in San Francisco on Sept. 19, 2018. Photos: Sean Liming. SAN FRANCISCO — After breaking up, some legendary bands trudge on, troublesome members replaced, until they’re spit out the bottom of the county fair circuit. Others atomize; the members scattering in order to delve even more deeply into the musical cranny they emerged from. 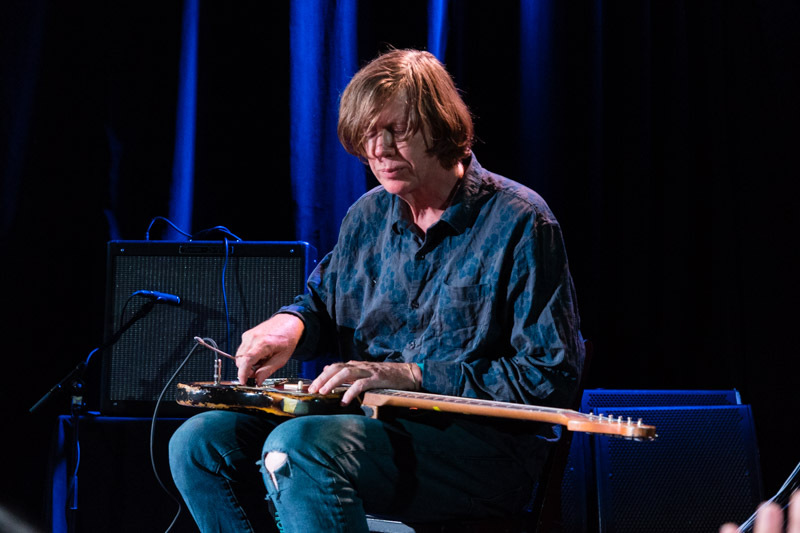 Thurston Moore, the former frontman and guitarist for the avant-grunge outfit Sonic Youth, spent Wednesday night at the Chapel providing a guided tour of the eclectic and experimental sonic territories he’s staked out from himself since his iconic marriage with bandmate Kim Gordon dissolved in 2011 and the band broke up soon after. 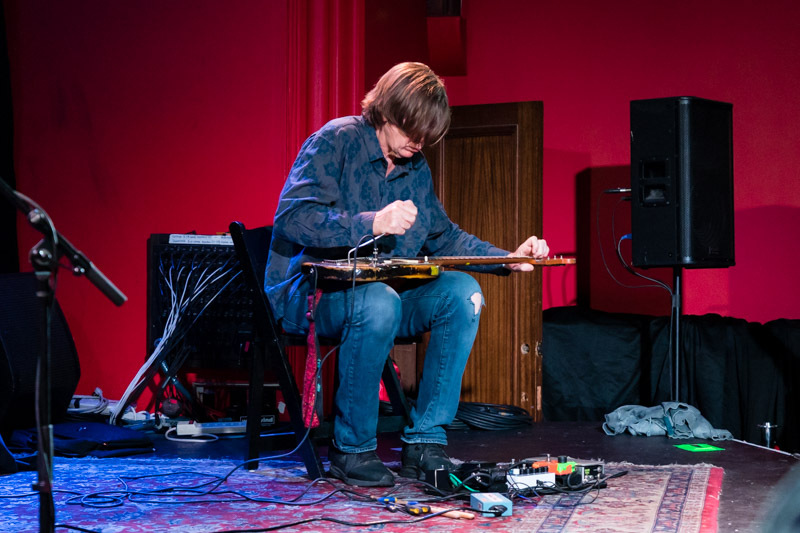 Moore, who just turned 60 in July, was the star of the bill that featured a pair of duos and began with a set from experimental percussionist William Winant and composer-performer Zachary James Watkins, who manipulated a table—and ironing board—covered with electronics and a tangle of wires. 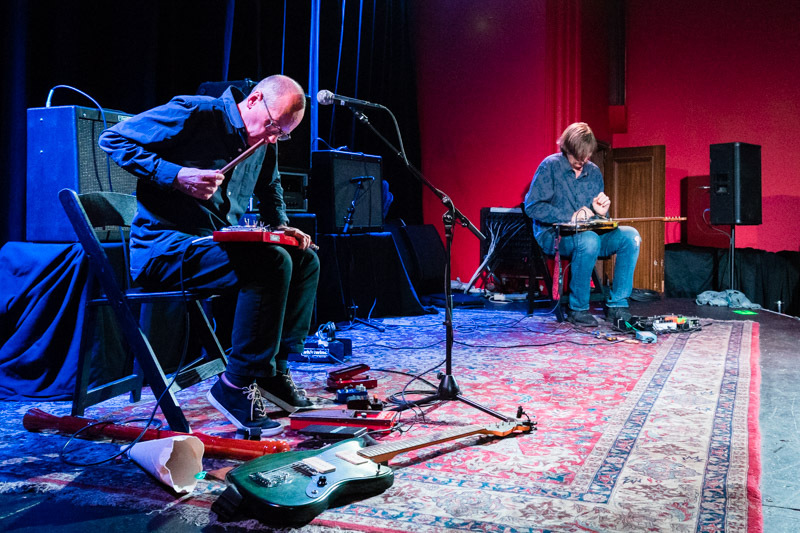 Thurston Moore and his accomplice for the evening, experimental musician and audio culture scholar David Toop, each sat on folding chairs before an array of pedals. Toop had a lap steel and Moore had a familiar-looking Fender guitar slung across their laps. Moore, donning his uniform of button down shirt and blue jeans with ripped knees, sounded subdued as he introduced Toop without the benefit of the P.A. system. 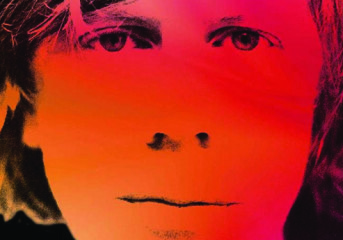 The music began quietly, mostly the incidental sounds of the bar mixing with amplifier hum as Moore conjured metallic wheezes with his abuse of his guitar’s whammy bar. 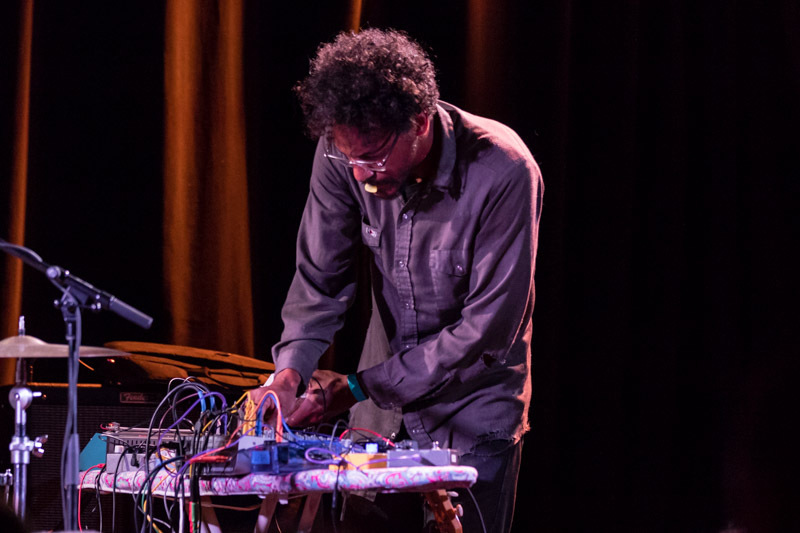 Toop created shards of sound that cut through the air. 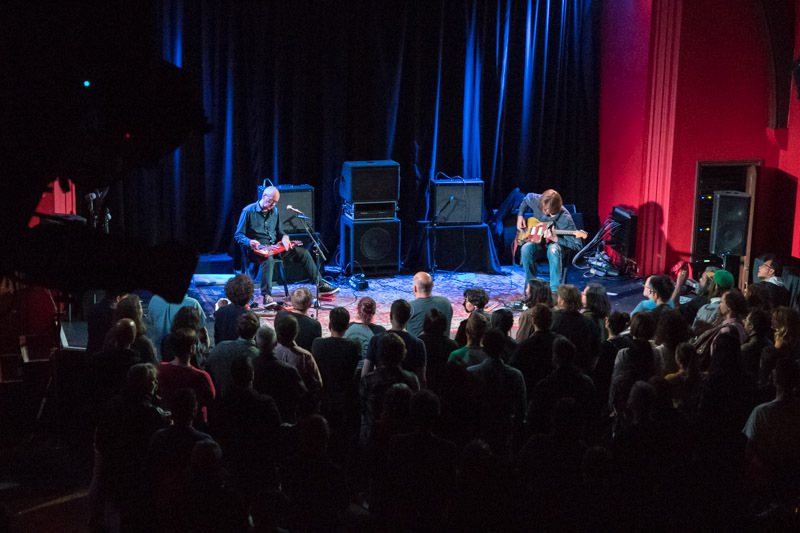 Soon both guitars became ominous percussion instruments as Toop and Moore banged on their strings. 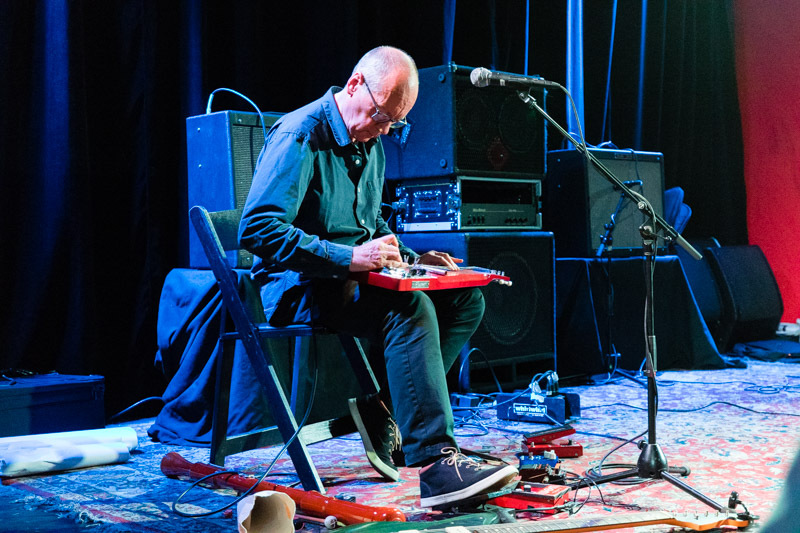 As Moore dragged various pieces of metal across his guitar strings, the high-pitched drone sounded like whale songs on acid, only much louder. 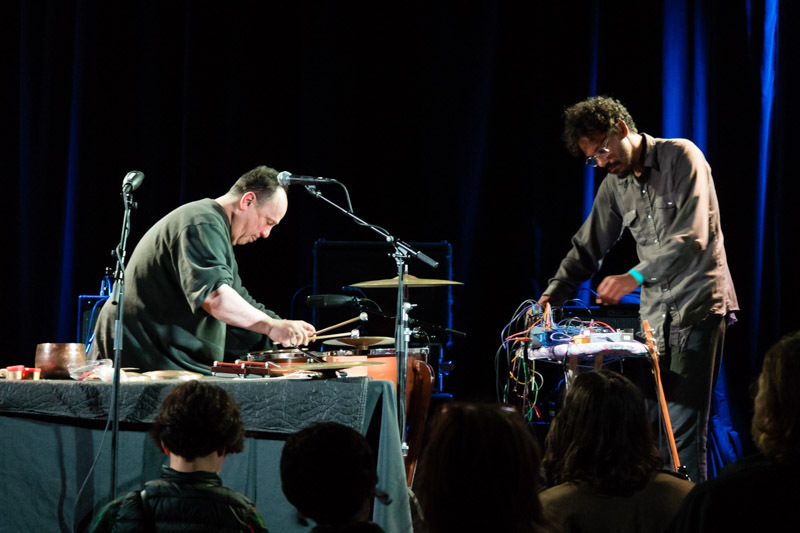 The musicians’ attention was focused on their instruments as they hovered over them, at times performing a sort of sonic surgery composed of precise movements and careful manipulations of guitar knobs and switches. 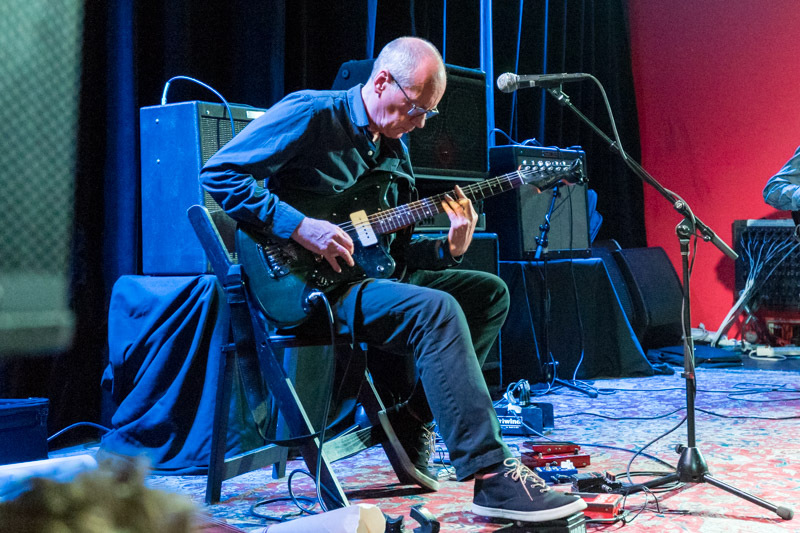 At one point Moore stood up, walked over to his amplifier, and elicited long, blade-like wails of feedback. 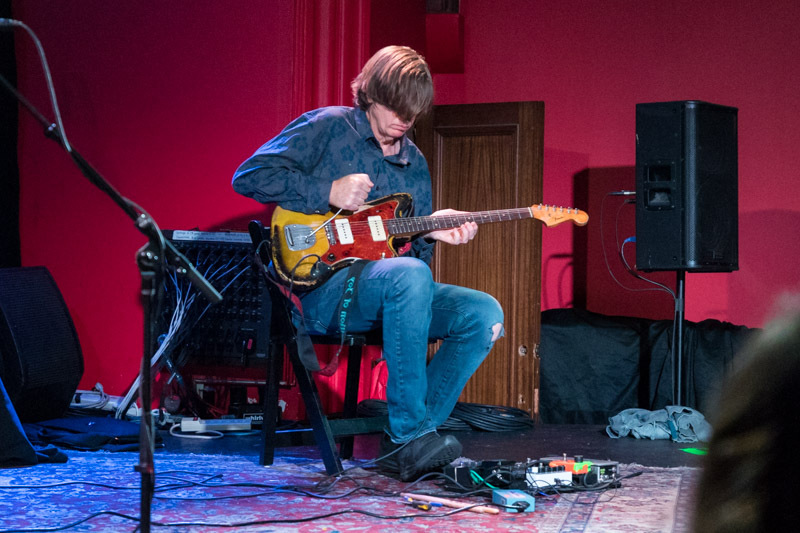 The Sonic Youth hits were absent during the 40-minute set, but at times the audience heard echoes of the band’s tube-driven textures and noisy interludes, particularly from Sonic Youth’s later experimental albums: SY1, SY2 and SY3. 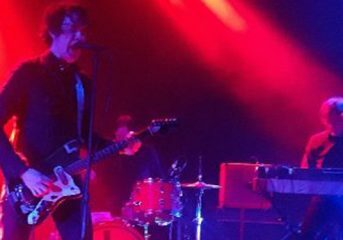 The performance was a long way from Thurston Moore’s rock god days playing for stadiums full of moshing fans in the early ’90s. 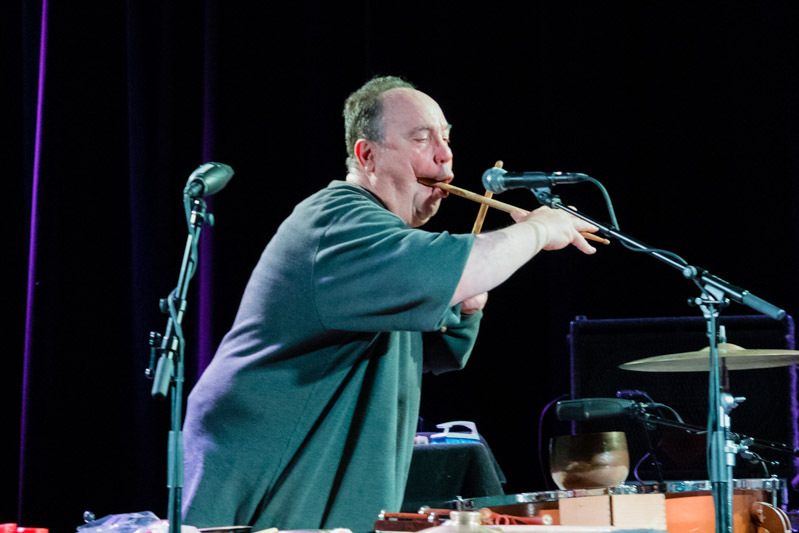 Moore assumed an almost professorial air as he sat on stage Wednesday, with the air of someone simultaneously as comfortable studying the primordial roar of sound as he is riding its wave. He was doing exactly what he wants to in his golden years. 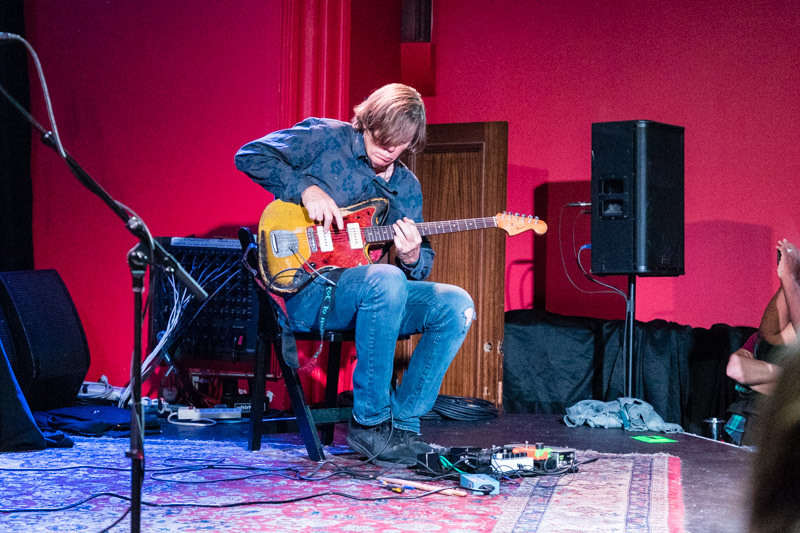 Zachary James Watkins and William Winant Duo perform at The Chapel in San Francisco on Sept. 19, 2018. Earlier in the evening, the tall and slender Zachary James Watkins swayed to the saxophone-like feedback he coaxed from his guitar, while William Winant pummeled a kettle drum with, among other things, both ends of a pair of mallets, hand cymbals and a pine cone. The loud rumble conjured by the pair reverberated through the large hall. 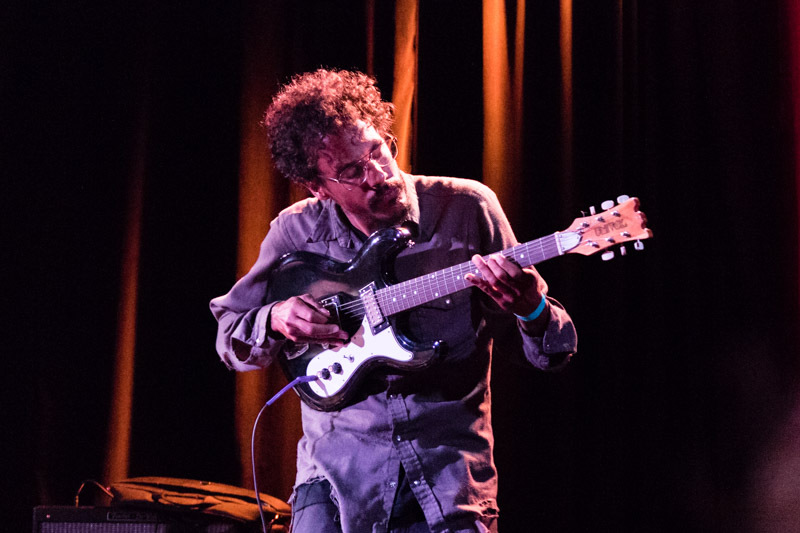 At one point during the single 40-minute piece of improvised music Watkins conjured a solitary howl that wavered, revealing a complex series of overtones as it rang out. Winant added to the sonic wash with a rising wave of static he generated in the single most rock and roll moment of the night by banging on a giant gong with hand cymbal. 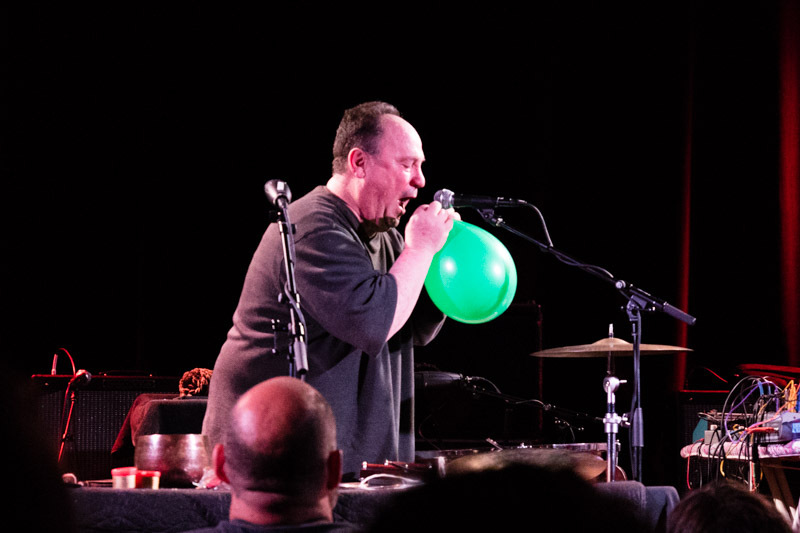 Before the set drew to a close, Winant slowly let the air out of a green balloon held in front of a microphone. The resulting rubbery squeals and shrieks were both hair-raising and sinus-clearing. 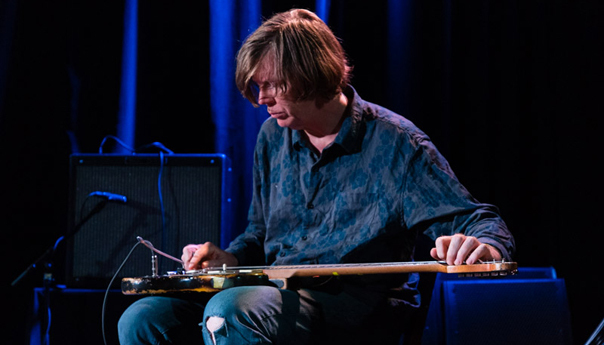 Thurston Moore performs at The Chapel in San Francisco on Sept. 19, 2018. 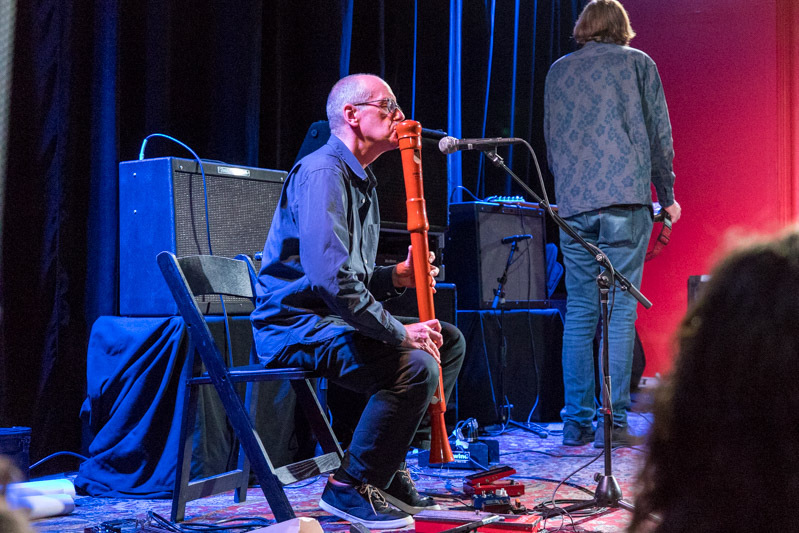 David Toop performs at The Chapel in San Francisco on Sept. 19, 2018. 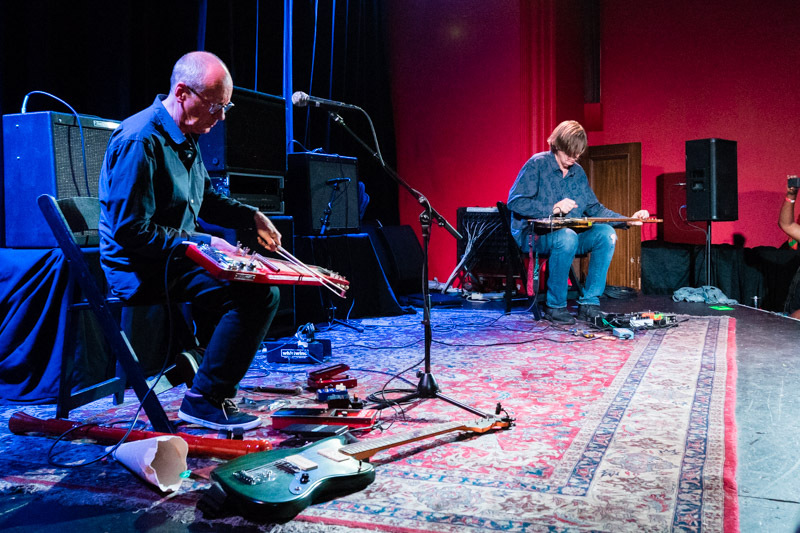 Thurston Moore and David Toop perform at The Chapel in San Francisco on Sept. 19, 2018. Follow writer David Gill at Twitter.com/songotaku. Follow photographer Sean Liming at Twitter.com/SeanLiming and Instagram.com/S.Liming.